When Handcrafters first start out, one of the most difficult expenses can be the cost of a good mold. Any seasoned soapmaker can tell you that a good mold is worth its weight in gold; but if you are just starting out and aren’t quite sure if you even like the process yet, we have a few guidelines you can follow to transform things around you into a usable mold instead. This popular loaf mold has a removable silicone liner for easy cleaning and unmolding. 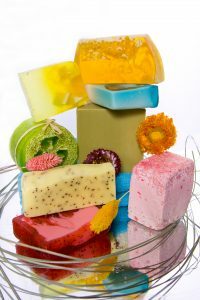 Don’t use anything that you couldn’t put in the microwave; using a plastic mold that is thin and easily melted will cause a very unpleasant outcome for your soap. 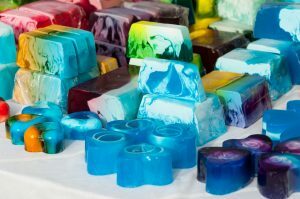 Although you won’t be applying heat to the mold itself, your soap will go through a heated chemical reaction while inside (or in the case of hot process, will be very hot when it is molded). Make sure you are using something that can withstand these high temperatures. This is very important! If you are making hot or cold process soap, do not use aluminum, tin, or any other metal except for stainless steel. Sodium hydroxide reacts with these metals and contact with them will release dangerous hydrogen gas. Avoid this by sticking to silicone, sturdy plastic, glass or stainless steel. 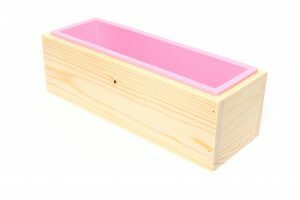 Do you have a glass loaf pan that you think would work great for soapmaking? Awesome! You can absolutely use a glass loaf pan or something similar, but you will thank yourself later if you take the extra step to line it first. You can use something as common as freezer paper to line your mold, and when you are ready to unmold, you’ll be able to just pop the soap right out! This is much easier than the alternative; rigid walled molds are very difficult to get your soap out of if you have not lined them. Soap batter is heavy and very hot while it is in the mold. If you use a mold with flimsy walls, you may return to your workspace to find that the soap has broken free of its prison and has made quite a mess! To avoid this, choose a mold that is flexible, but have a separate way to keep the walls from collapsing outward. You can do this by setting the mold in a fitted wooden or cardboard box, or placing heavy objects on either side of the mold. Play with different creative molds to find a unique shape for your product! There are many things that you can use for a mold; shoe boxes, Pringles cans, yogurt containers, milk cartons, you name it! Make sure that no matter what you use, you are able to properly sterilize it and it will be easy to unmold so that your finished product looks great from start to finish. Do you have a creative mold that you love to use? We want to see! Comment on the Facebook Post for this blog article with a picture of your favorite unconventional mold.